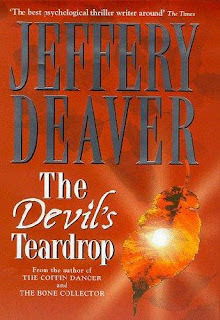 As amazing and engaging as The Devil's Teardrop is, I found it to be the most mass-markety of all the others I've read by Deaver, and even contained the common, cheesy formula of encroaching love between two characters. I understand that in most cases, the romance side-element has to be included to appeal to women readers, but it really isn't necessary with Deaver's books. In addition, the action and storyline of The Devil's Teardrop is slower-paced and lags in some spots in comparison to Deaver's other novels. The forensic aspect in this novel is pretty boring, considering I've always felt that forensic-document examination is perpetually awe-inspiring. Another component I noticed is that there is too much time and inner-monologue on the romance building between Kincaid and Lukas. If I want mass-market romance, I'll pick up Nora Roberts ! 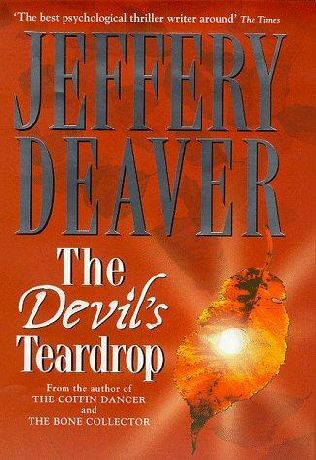 Overall, The Devil's Teardrop is a good read, but if you're already a Jeffery Deaver fan, it may let you down. I wouldn't waste your time if you've got a stack of other books waiting for you at home. My favorite novels by Jeffery Deaver include The Sleeping Doll (2007), The Bodies Left Behind (2009) and the entire Bone Collector series. Deaver's newest novel is Edge (2010).